Art becomes valuable through its uniqueness. Stefano Sanna’s unique pieces are easily recognizable and impossible to copy. He uses wood, canvas, paper and paint, largely combined with other materials and components. Depending on the structured concepts of a new series, Stefano uses old and worn pieces of wood, metal and plastic. Once Stefano Sanna has specific and concrete ideas for new pieces and series, which are mostly wall paintings and some sculptures, he finds the materials for his art pieces both purposefully and on a randomly. His surroundings, the northern part of the island of Sardinia in the Mediterranean Sea, are his source for color, form, and materials, and thus also the source of his art. After a heavy storm, he searches early in the morning the beaches for flotsam, which has been washed up by the sea. He believes that the wooden planks and metal plates, lost by ships sailing in rough seas, tell stories which he turns into works of art. However, the creative processes extend well beyond “recycling art”. The materials go through a special metamorphosis through Stefano’s creative refining and abstraction processes. One could assume that Stefano Sanna’s work defines a new art direction for “metacycling”. In addition to the virtuous combination of old and new materials, Stefano often incorporates figurative elements. His professional education as a graphic artist and comic illustrator allows his pieces to tell an entire story. Just like many great artists before him, he is also fascinated by numbers and letters, which he superbly combines with figures or fictional symbols. The continuity and recognizability of Stefano’s art are extraordinary. He has consequently developed his style since 2004 in a harmonic manner. Therefore, his work must be seen in the context of Japanese Kaizen, which turns continuous development into a cultural principle. Refined and polished processes are created from optimizations by developing them in meticulous steps. They become recognizable when one accompanies the creative process of Stefano Sanna’s wall pieces. When beginning a new art piece, Stefano always has a concrete idea in mind that he wishes to develop visually through his work with the materials. He relies on the materials’ natural reactions, such as metal rust, mold in natural objects, and the weathering of wood and plastic parts. His idea creates virtual pictures of finished objects in various dimensions. Stefano’s ideas go through various experimental and testing processes before he starts working on a new unique piece. 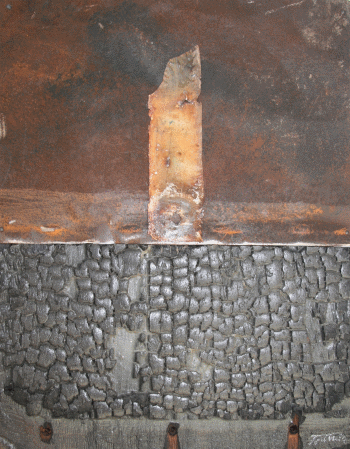 At times, it may take months or years until the desired effects actually occur, such as rust and other corrosive effects. The actual structured work preparation only begins when all components of a new piece in a series have been validated. Stefano learned the meaning of optimal work preparation during the course of his education in Milan. All components must be prepared in their final form before the actual realization process can begin. When observing Stefano’s workshop and studio, one can only be amazed by the artist’s system and professional order. Countless components which have been collected by Stefano during the past 15 years, are stored in a particular orderliness and put to use at the appropriate time in the final realization process. While the first three stages of the process may sometimes take months or years, the actual realization process of a work of art is very rigorous and focused. In the first creative phase, Stefano mostly works late in the evening and during the night, in order to concentrate fully on his work. Needless to say, as in the case of many artists, there are times when the final result does not correspond to Stefano’s visionary ideas. This gives way to a renewed process with new experiments and test series. Stefano Sanna was born in 1975 in Nigeria to an Italian/Sardinian father and a Swiss mother. He began his art studies in Milan in 1994, majoring in graphic art and design. Subsequently he worked as an illustrator and comic book artist. 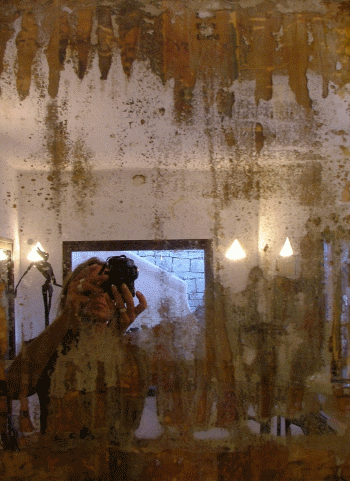 Since 2004, he lives in Costa Smeralda, Sardinia, where he works as a successful independent artist. 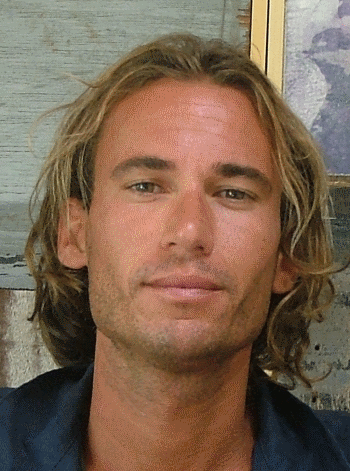 For Stefano Sanna, Sardinia and particularly the north coast of the island where the Costa Smeralda is situated, are his source of energy and inspiration. This especially includes the unique colors of the island, with its rock formations, rich fauna, white beaches and emerald-colored water. The various tones of blue (sky and sea) are particularly inspiring, combined with warm sand and beige tones (beach and buildings backdrop), which release an astonishing energy potential for people at sunrise and during sunset. Stefano Sanna likes to enjoy life’s pleasures just like many other artists. Sardinian cuisine with its original pasta creations, varieties of seafood and special kinds of vegetables, typical Sardinian bread, Pane Carasau, and naturally, special red and white Sardinian wines. The artist works at the Costa Smeralda, well-known as an exclusive region in the north of Sardinia. The “Costa” was developed in 1962 by Prince Aga Khan, who together with leading architects, created an extraordinary cultural and building landscape. In this milieu, Stefano’s art has been appreciated by international collectors and art lovers for more than 12 years. 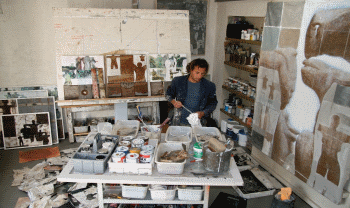 His individual and group exhibitions have made Stefano well-known also outside of Sardinia. Starting in 2018, Stefano Sanna’s art will be presented in international exhibitions in Europe, the US and Asia.